You’re surrounded by sharks. They’re hammerhead sharks with flattened heads. They’re low in the water, searching for food along the ocean floor. There’s a lot of them. It’s hard to count how many are in the school, since they’re constantly changing direction with sharp movements. And there isn’t anything, like a metal cage, between you and them. You try to slow your breathing, but your heart won’t stop racing. This is one of the scariest moments of your life. These shark-infested waters surround Jarvis Island. The United States territory is one of the Line Islands, a chain of 11 volcanic islands that, spread over nearly 1,500 miles, forms one of the longest island chains in the world. It’s in the South Pacific, halfway between Hawai’i and the Cook Islands. 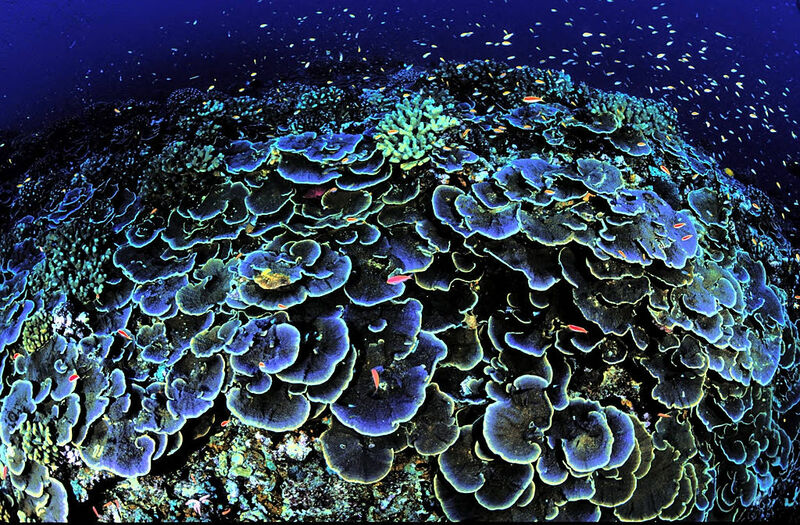 Plus it’s part of the Pacific Remote Islands Marine National Monument. Jarvis Island was uninhabited when it was first sighted by a British ship, owned by Thomas and William Jarvis, in 1821. Both Britain and the United States claimed the coral island and mined guano here in the century that followed. The United States eventually attempted to set up the settlement of Millersville, plus a weather station and a landing field, in the 1930s. It was evacuated during World War II, after a Japanese submarine fired shots toward the shore. It’s been protected, first as a national wildlife refuge and now as a marine national monument, since 1974. Today there are only remnants of Millersville. The tram tracks, from which guano was mined in the center of the island, are overgrown with bunch grass and prostrate vines. The never-used airstrip is hard to see, as well. Plus a lighthouse-shaped day beacon is crumbling near a boat landing on the west coast. There is life on the island, though. It’s ruled by birds, who nest, roost, and forage here. Almost one million pairs of sooty terns and 7,000 pairs of masked boobies, both among the largest colonies of their species, call the island home. They live in harsh conditions—high temperatures, strong sunshine, and constant wind. But they’re rarely disturbed. Nor are the hammerhead sharks, the moray eels, or the brilliantly colored coral that live in the reef off the east coast of the island. As your heart rate starts to relax, your fear turns to awe.